This is a really fun before and after master suite for a busy couple that deserved a retreat to escape to at the end of the day. My clients lived in a builder basic home that was not living up to it's full potential. Every surface, from the bedroom walls, floor, and ceiling to the bathroom tile, fixtures, and trim were various shades of off-white. This master suite left little to be desired, and despite having really unique architectural angles, the high ceilings and beautiful windows weren't being highlighted. This client hired Fuchsia Design for our expertise in space planning and reconfiguring. The existing layout (shown below) had dual vanities with a large tub, walled-in shower, and private water closet. There was a lot of wasted space and the shower and toilet room felt very closed in. 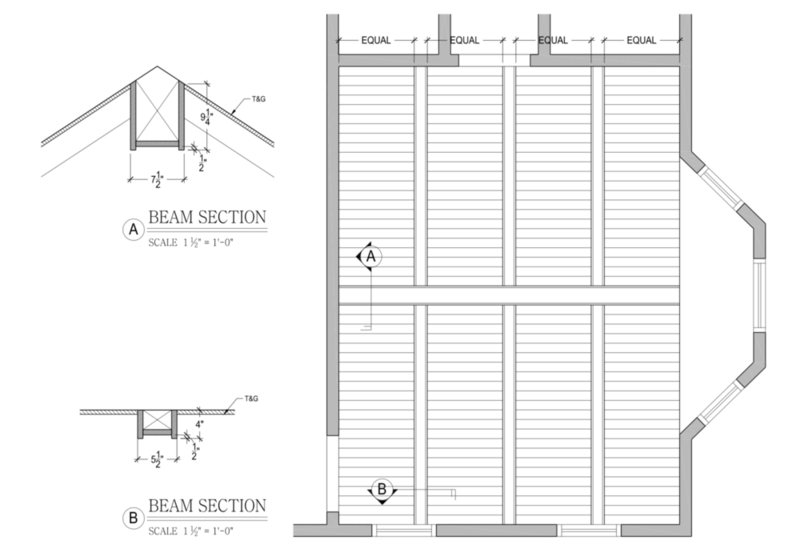 We reviewed the existing layout of the bathroom and proposed 4 possible layouts that made better use of the space. 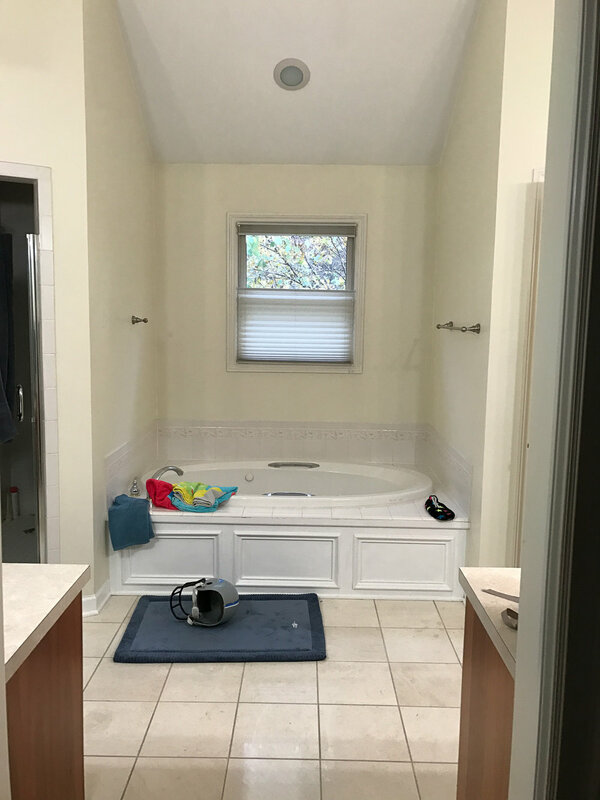 The homeowners chose Option 2 which removed the bathtub, pivoted the private water closet, added a linen cabinet, and expanded the size of the shower. The great thing about this layout was that, for the most part, it kept the main plumbing lines where they already were which allowed us to delegate a larger portion of the budget towards gorgeous quartzite countertops and luxurious plumbing fixtures. We incorporated this new linen cabinet and matched the door style to the existing vanities. Then, we had the existing bathroom vanities refinished to match the new linen cabinet so both look brand new, and appear as if they were purchased at the same time. The opening to the left has a pocket door that opens to the private water closet. This shower is stunning! The slate tile give it a natural but contemporary vibe, and the stone pebble floor provides a spa-like experience. It's complete with 4 body sprays, a hand shower, and a shower head. The glass enclosure gives it a much more open feel compared to the walled-in shower that used to be in it's place. This bathroom has so much storage now! These quartzite countertops are to die for. 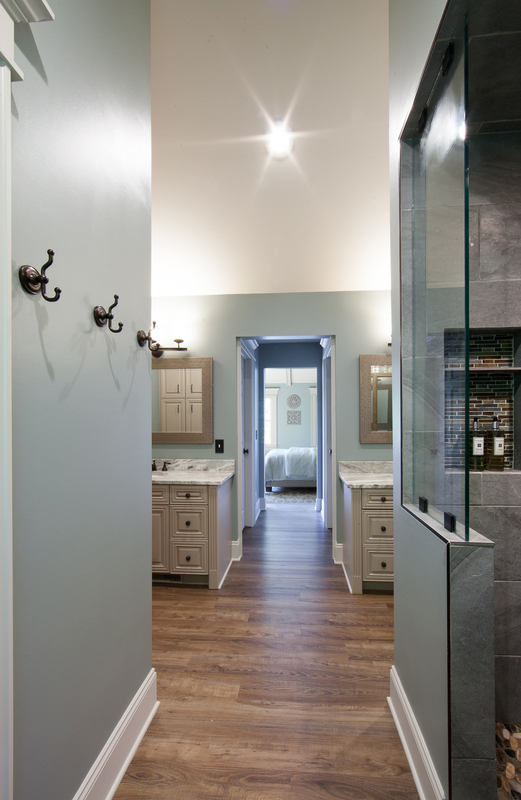 Dual vanities means the husband and wife each get their own side complete with their own private closets in the hallway which leads to the bedroom. 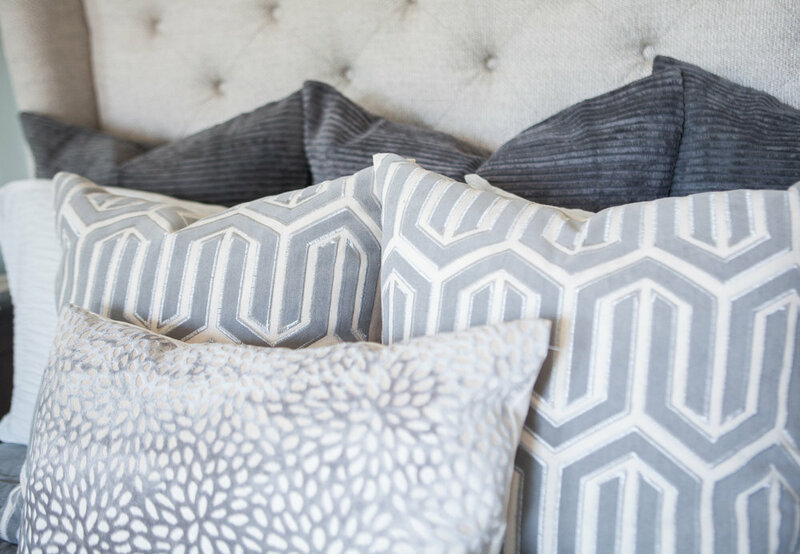 Let's talk about the changes made in the bedroom! I wanted to highlight the tall, vaulted ceilings, so we added cedar tongue and groove with contrasting beams and can lighting. We also moved the bed to the adjacent wall which allows sunlight to pour into the space. The sliding barn door was a feature the client was so excited to incorporate, and I love the upgraded window casing that we designed! The style of this family's home is comfortable yet traditional, so we kept with a calming palette of ivory, blue, green, and warm brown. By incorporating eclectic artwork, mixed patterns and wood tones, and accessories, it gave the space a comfortable vibe that matches the rest of the home. So, let's take a moment to look back on where we started and how far this space has come. So - that's a wrap! What do you think? What's your favorite part? Are you ready to tackle a room in your home that's not living up to it's potential? LET'S DO IT!